The Outer Beltway was first conceived in the 1950s and it was an active proposal until about 1980. Much of it would have been at about twice the radius of the Capital Beltway, although it would have been closer in near Rockville, passing just south of Rockville. It would have formed a complete circumferential freeway around Washington, D.C. I drew the route and the interchanges of the proposed Outer Beltway on this copy of the 1980 MDOT SHA state road map. 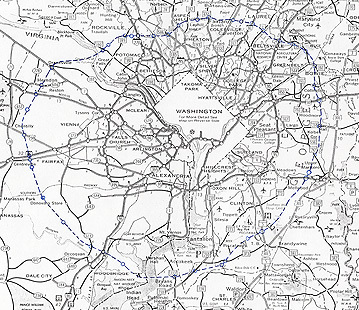 The dashed blue line is the Outer Beltway route, and the small circles signify the interchanges. Click for large image (567K). This proposed route had 37.1 miles in Virginia and 64.7 miles in Maryland, for a total of 101.8 miles. It had 13 interchanges in Virginia and 31 interchanges in Maryland, for a total of 44 interchanges. The proposed route had 6 lanes (3 lanes each way) throughout. 1) Master Plan of Highways For Montgomery County Maryland, 1967. 2) Master Plan of Highways For Prince George's County Maryland, 1967. 3) Master Plan of Highways For the Maryland - Washington Regional District, in Montgomery and Prince George's County, Maryland, 1967. The above Maryland sources were published by The Maryland - National Capital Park and Planning Commission. The links are from the website of Marylanders for a Second Crossing. 4) Northern Virginia Major Thoroughfare Plan, Virginia Department of Highways, 1969. I have viewed the paper version of the NVMTP, and the referenced webpage accurately represents the proposed alignment of the Outer Beltway in Virginia. Four decades of conceptual planning for a major bypass facility to serve the growth in travel demand forecast for the metropolitan Washington area have preceded the Western Transportation Corridor Study. Such a facility, referred to as "The Cross Country Loop", first appeared in April 1950 on a map prepared by the National Capital Planning Commission and called "Regional Proposals of the Comprehensive Plan". In Maryland, the first official document on which the outer beltway concept appeared was the "Master Plan of Highways for the Washington-Metropolitan Regional District" in 1953, prepared and adopted by the Maryland - National Capital Park and Planning Commission. An outer beltway also was included in the Commission's 1964 General Plan entitled "On Wedges and Corridors" and was in its 1967 "Preliminary Master Plan for Highways." In addition, an outer beltway was included in the 20-year Highway Needs Study for Montgomery and Prince George's Counties, prepared by the Maryland State Roads Commission in 1967. On the Virginia side, an outer beltway was included in the Northern Virginia Regional Plan for the Year 2000, published in 1966 as the Northern Virginia Development Guide, prepared jointly by the National Capital Regional Planning Council and the National Capital Planning Commission. In addition to an outer beltway, the guide included another circumferential alignment farther out along the general alignments addressed in the Transportation Corridor Study. 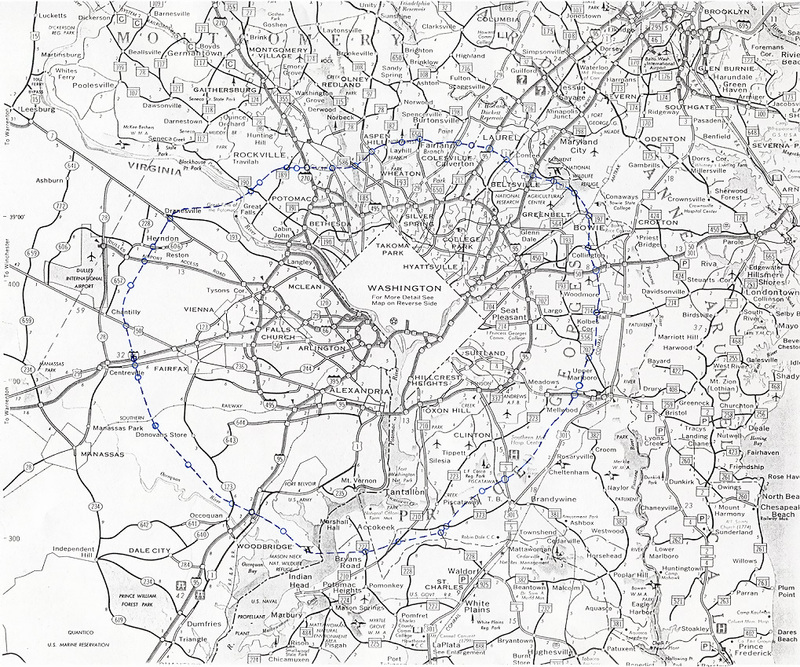 In 1969, The Northern Virginia Major Thoroughfare Plan, prepared by the Virginia Department of Highways, included the concept of an outer beltway facility to serve the projected travel needs for 1990. In 1970, a Transportation Study for Montgomery and Prince George's County, Maryland, prepared by the Maryland - National Capital Park and Planning Commission, also recommended an outer beltway to meet 1990 travel demands. The first long-range transportation plan adopted by the [MWCOG] TPB in 1972 included much of the second circumferential freeway that was in the 1966 Regional Development Guide. For most of the next decade, the concept of an outer beltway, or regional bypass facility, received little attention, in part due to increasing environmental concerns, limitations on highway construction funds and the general hope that the planned Metrorail transit would address many of the future travel demands of the region. See my article Washington Bypass Studies for details on what has been officially studied since 1980 for an outer Washington freeway bypass. These studies evaluated alignments that were,for the most part, much farther from D.C. than the proposed Outer Beltway. There are major consequences resulting from the fact that the Outer Beltway was not built, nor was any portion of it built. The existing Capital Beltway (I-495) was designed with the regional plan that I-95 would go through D.C., and with the plan that an Outer Beltway would be built around D.C. in the future. Instead, I-95 was cancelled in D.C. north of New York Avenue, and the I-95 routing was shifted to the eastern half of the Capital Beltway in 1977; and no outer freeway bypass of any portion of the Capital Beltway, was built. The chief consequence is an overloaded Capital Beltway, much of which carries 200,000 to 230,000 vehicles per day on eight lanes, with congestion for a number of hours per day. The massive $2.5 billion expenditure on the Woodrow Wilson Bridge and approaches project (7.5 miles of the Capital Beltway) would not be needed if not for the fact that I-495 is being forced to serve the role of I-95 and the regional bypass. A simpler Beltway widening to 4 lanes each way (one new lane each way), and no interchange expansions at VA-241, US-1, I-295 and MD-210, would probably suffice (costing about $500 million) if -either- I-95 was completed through D.C. -or- even just the eastern half of the Outer Beltway was complete. The extreme volumes of trucks wouldn't be the case; overall average daily traffic and truck percentages would probably work fine on a widened 8-lane Woodrow Wilson Bridge. The WWB was opened in 1961 and was designed for 75,000 vehicles per day. The reason for its structural problems are the result of the fact that it is being forced to serve a purpose and traffic volume that it was never intended to, in 2002 almost 200,000 vehicles per day with 11% large trucks. The WWB was designed with the plan that I-95 would go through D.C. and not be overlapped with I-495 across the WWB, and with the plan that an Outer Beltway would be built around D.C. The Outer Beltway was planned conceptually in the 1950s, even before the Capital Beltway was started. Since I-95 through D.C. and the Outer Beltway were not built, the Capital Beltway (and the WWB) is subject to extreme traffic loads, that continue to grow. The massive $676 million Springfield Interchange Project to rebuild and expand the interchange of I-495/I-395/I-95/VA-644, is so huge primarily because of the huge amount of interchanging traffic between Shirley Highway (I-95 and I-395) and the Capital Beltway (I-495 and I-95). The original interchange was built fairly well for its original purpose of carrying I-95 on Shirley Highway and I-495 on the Capital Beltway, and interchanging between the two, and some expansion would be necessary if I-95 had been completed through D.C., but far less than expansion than is being constructed now, since today's freeway network makes I-95 flow between Shirley Highway and the Capital Beltway. If I-95 was complete through D.C. and the full Outer Beltway was complete, then much of the expenditures to widen I-95 north of Woodbridge, I-66 east of Centreville, and I-270 south of Rockville, could have been deferred, since there would be less traffic pressure on those segments. Much of the Fairfax County Parkway could have been deferred too. D.C. I-95 and the Outer Beltway would have cost a lot to build, but probably $2.5 billion of the $3.176 being spent on the Woodrow Wilson Bridge Project and the Springfield Interchange Project, would not need to be spent today (1999-2007). So the high expenditures on the WWB project and the Springfield Interchange Project, are a direct consequence of not completing the original regional freeway plan. Copyright © 2003-2004 by Scott Kozel. All rights reserved. Reproduction, reuse, or distribution without permission is prohibited.